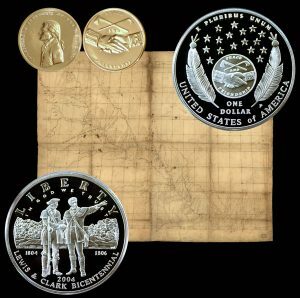 Today, the Lewis and Clark Commemorative Silver Dollar Coin remembers when the men began their journey from the Midwest to the Pacific coast and back again when they launched their boats near St. Louis on May 14, 1804. As the history of the Lewis and Clark exploration has never been very extensively published, or generally read, a brief review of it may interest many readers. Few people of this day know how small and poor our country was at that time. In population the United States numbered less than five and a half millions. Ohio was the only State west of the Ohio river, and she had enjoyed statehood but one year. Indiana had but recently been organized into a Territory, and was the most westerly Territory. The wheels of a steamboat had never disturbed any of the waters of America, and not until four years later, did the “Clearmont,” Fulton’s first steamboat, make her maiden trip on the Hudson. A railroad, with steam engines drawing their mighty loads of freight across the country had never entered the thought of man, and it did not come into existence for twenty five years. The wildest dreamer had never imagined the telegraph flashing words and thoughts over the country with the speed of light, or the electric light, electric power, the telephone, or of the hundreds of thousands of useful and important inventions which have since been made. At that time all of the small grain of the world was harvested with a sickle, and the most visionary farmer had never hoped for the great reaper and thresher of today. Then every housewife in America cooked her meals by the open fireplace, in the “dutch oven,” the pot and the frying pan, because the cooking stove was yet among the things unknown. She had to light her fires by the flint and steel, or the tinder box, as friction matches were not invented until twenty six years later. Gas and coal oil were unknown for lighting purposes, candles and fish-oil lamps being almost universally used by our people. Such was the condition of the country at that time, and very few of this age can realize the great change that has taken place—the vast difference between then and now. Lewis and Clark, with their men, met at Louisville, Ky., on the 5th day of July, 1803. After procuring suitable boats, they set out on their wonderful voyage, proceeding down the Ohio to its mouth, thence up the Mississippi, passing St. Louis —then only a village of shanties, inhabited by Canadian French, Indians and half-breeds—reaching Wood (De Bore) river in December. There they encamped for the winter. After building log huts in which to live, they spent their time in drilling the men and preparing to start in the spring, as soon as the river was free from ice. The party contained 45 men, all of whom were enlisted in the United States army, excepting a black man, York, a slave who belonged to Captain Clark. On the 14th day of May, 1804, the company embarked in their boats, one of which was a “keel boat” 55 feet long, rigged with a large square sail and 22 oars, and two pirogues, one having five and the other six oars. They were provided with two horses, which were led along the bank of the river to be used for carrying the game which the hunters might kill. Their progress up the Missouri was necessarily slow against the stubborn current of the mighty river. When it was possible, they used the sail, and often made good progress by its use, but when the wind was adverse or during a calm, the oars and the setting pole or towline were brought into play. At the mouth of each tributary river of any considerable size, they stopped, took observations, and explored it for some miles to learn the course, depth and width. Hunters were kept out most of the time, who found it an easy task to supply the camp with meat. From the mouth to the head of the Missouri, those boundless plains of unsurpassed fertility were dotted with herds of buffalo, elk, deer and antelope, while beaver, bear, geese, brant, duck, wild turkeys, quail and pheasants were exceedingly plentiful. The buffalo were innumerable. They frequently saw herds containing 10,000 or more, and throughout the length of that river they were seldom out of sight of them. All over that vast empire from St. Louis to the summit of the Rocky mountains, from away north in Canada, south to the plains of Mexico were countless thousands of them. When I came over the “Oregon trail,” 50 years ago, with an ox team, they were very numerous, though their numbers were much reduced. Along all of the rivers were thousands of their deeply trodden trails, made by their regulation single-file mode of traveling. All of those trails led by the most direct route to water. It seems to have been their habit to graze until they were very thirsty and then go on a sweeping run, single-file, to the nearest water. It is less than 100 years since Lewis and Clark saw them in such innumerable multitudes, yet the buffalo has disappeared from the face of the earth—is practically extinct. The survival of the fittest prevailed. Now man tills the soil that gave them food. Their drinking places are now steamboat landings and mill sites. Their pastures are farms and fields, dotted with dwellings, towns, cities and striped with railroads. The expedition had not proceeded far until they met a party of traders from the Sioux nation, on rafts, laden with buffalo hides, furs and buffalo tallow. Among them was one “Dorion,” a Canadian Frenchman, who had lived among the Sioux for 30 years, and whom, after much parley, Lewis and Clark succeeded in hiring to accompany them as far as the Sioux Nation, as interpreter. Six years later, as interpreter, “Old Dorion” accompanied the Astoria expedition to the Pacific Coast under the command of Wilson G. Hunt. When Lewis and Clark entered the domain of a new tribe or nation, they halted to make their acquaintance, and learn all they could of their habits and surroundings. They had with them a large number of men’s coats, made of bright red cloth and trimmed with gaudy tinsel. They called together the chiefs and principal men, and after smoking with them “the pipe of peace” presented each chief with a coat, and some of the principal men with smaller presents, informing them that they were sent to them by the “Great Father,” the President of the United States, and that he would send his people out to trade with them, and buy their furs and hides and all they had to sell. They also had many United States flags and large silver medals, which they distributed among the different tribes. Several of these medals have been found about old Indian encampments in recent years. The Lewis and Clark Commemorative Silver Dollar Coin shows with an image of a map of the Missouri River and vicinity from Saint Charles, Missouri, to Mandan villages of North Dakota, used by Meriwether Lewis and William Clark in their 1804 expedition.